Annette Bergeron, P.Eng. MBA, FEC is a past president of Professional Engineers Ontario (2014), and was president and chair of the Ontario Society of Professional Engineers (2005, 2010). She currently serves on the boards of Engineers Canada, and the Electrical Safety Authority (of Ontario), after teaching and administrating at Queen's University in the Faculty of Applied Science, and School of Business. 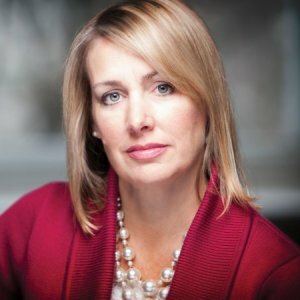 She has twice been named one of the Top 25 Women of Influence in Canada. 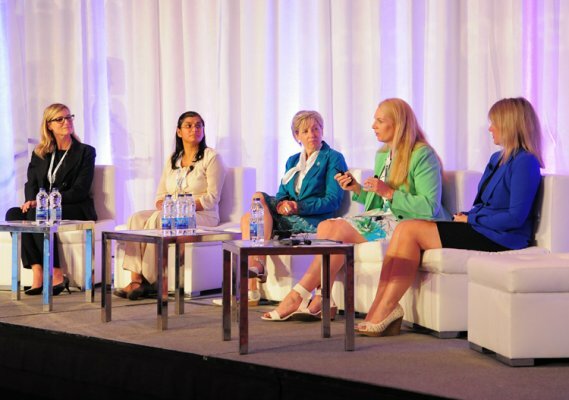 An experienced speaker, Annette was most recently the luncheon speaker, panel Chair, and multi-panelist at the Canadian Coalition for Women in Engineering, Science, Technology, and Trade. She graduated in materials and metallurgical engineering at Queen's, and Masters of Business Administration at Schulich School of Business, York University. Specializing in executive leadership and governance of Not-For-Profit corporations with experience in both the private and public sector. Experience in external stakeholder and government relations with capacity to engage in and influence policy. A strong, personable leader both within and external to the organization. A team builder with a collaborative management style, keen business acumen and financial oversight, and innovation in systems, processes and communication media. Recognized in the profession of engineering with experience ranging from the Regulatory and Advocacy Associations, to heavy industry and engineering education. Three decades of experience in engineering, academic administration, business education, entrepreneurship, healthcare, and governance. Each year, we are honoured to celebrate the Top 25 Women of Influence, and share with our community their unique stories of passion, impact, and success. All of these women have made, and continue to make, a significant difference in their sector, with quantifiable results showing how they’ve executed on their vision." Recognizes the experiences and accomplishments of some of the leading women in materials, metallurgy and mining in Canada. A local engineer has made a top-25 list for the second consecutive year. Annette Bergeron has been named to the Top 25 Women of Influence list according to Women of Influence Inc.
"I was surprised and thrilled (to be named to the list) the first time and probably even more surprised the second time," Bergeron said. "It takes a community to make people successful, so I'm grateful to my parents, Lou and Lucile Saulnier, who raised me in Kingston and gave me everything that I needed to launch myself and my career." Along with being a professional engineer, a member of the Kingston General Hospital board of directors and a projects consultant with The Monieson Centre at Queen's University, Bergeron is starting her own business, Bergeron Consultants. "(Making the list) feels really good," Bergeron said. "It draws attention to three things that make me happy. Number 1 is women. Celebrating women for 20 years and the influence they have is a good thing when you think about how many accomplished women have been out there for over a century." The second thing is bringing a focus to women in engineering. "We're still only at 20% of graduates across Canada, and then when you get into licensed engineers, it drops to 10%," said Bergeron. "Those are fairly dismal numbers and it hasn't changed since I graduated, so what we need to do is find ways to attract young girls to engineering, and one of the ways is through role models." Bergeron is very proud to represent her hometown of Kingston. "The third thing that makes me happy about this award and why it's good, is it's good for Kingstonians," Bergeron said. "I think it draws attention to the accomplished professionals in Kingston, and there are many of them. We get lost a little bit between Toronto, Ottawa and Montreal. It helps draw attention to the fact that you can have a rewarding career in Kingston and do work." Women of Influence Inc. is celebrating its 20th anniversary and its fourth year of publishing its top 25 list. The goal of the list is to "strive to recognize women who've gone beyond the traditional measures of success to truly influence change." "Women aren't good at promoting themselves," Bergeron said. "There are lots of articles that are out there that will back that up, so having an organization that promotes the women for them is excellent. It's what we need." Bergeron earned an honours bachelor of science (Material and Metallurgical Engineering) from Queen's University and a master of..."
"As a companion piece to "Forging her own career path", we asked Kelli-anne Johnson, Sc'16, to conduct a career Q&A with Annette Bergeron, Sc'87. Kelli-anne studies engineering chemistry.She also works on the Engineering Society communications team and is a student ambassador for the Faculty of Engineering and Applied Science. In this latter role, she represents the faculty at the annual university fair and open house events. Kelli-anne: What advice would you give a student currently pursuing an engineering degree? Annette: My nephew is currently pursuing an engineering degree at Queen’s and my daughter is starting hers at McGill. I would advise them, and have advised all my students, that “It gets better, and it will be worth it.” Accredited engineering degrees in Canada build on a solid technical foundation of science and math. It may not feel like engineering in your first year, but the degree really evolves over your four years to the fun engineering stuff in fourth year. Ensure that you enjoy your university experience outside of your engineering courses; it’s better for you and that’s actually what employers are looking for in terms of well-rounded applicants. Kelli-anne: When you first graduated with an engineering degree, was it difficult to find a full-time job? Annette: Not in the late '80s. In hindsight, I was smart to choose a small discipline; three of five of us in metallurgical engineering were hired by Dofasco. Another advantage of Queen’s is that employers then conducted on-campus interviews for summer jobs. I was blessed to be hired by Dofasco for a summer job and then asked to return full-time. I understand that since 2008 it has been more difficult to find full-time work upon graduation. Persevere but don’t worry; you have 40 working years ahead of you! Kelli-anne:What did you find most rewarding about working as an engineer? Annette: I enjoyed starting my career in the steel plant. I worked with 300 ton ladles of molten steel. It is empowering to walk around the shop (like a boss) and know what everything does, like a personal laboratory but with a constant element of danger. Kelli-anne: What would you consider to be your biggest mistake? What did you learn from this situation? Annette: My biggest mistake would be extending my university work ethic into the workplace. In university, if you work and study hard, you will pass your courses with high marks and move on after graduation. In the workplace, keeping your head down..."
“I do see a value [in the Ban Bossy campaign], as simplistic as the concept may be,” explained Annette Bergeron, president of the Toronto-based licensing body Professional Engineers Ontario. In a nod to Ms. Wente’s column, Ms. Bergeron complained that she has been “sucking it up for 30 years” and wants a better environment for her daughter. Ms. Bergeron kept the report card her kindergarten teacher wrote in 1969 that chided her for being “a bit bossy at times.” She wonders how much she unconsciously toned down her leadership style after being labelled bossy as a child and compares the statement to one by her favourite boss, who last year described her as quiet, thoughtful, and strategic but not an A-type personality who pounds her fist on the table." 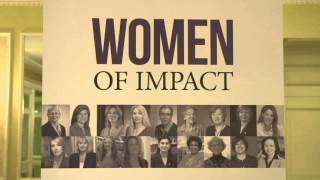 The CEO of Women of Influence interviews Top 25 Annette Bergeron. In her Grade 13 yearbook, Annette Bergeron, Sc’87, wrote that her career dream was to lead a large engineering organization. That was almost 30 years ago, and Annette has ­accomplished that goal – twice – and a lot more besides. 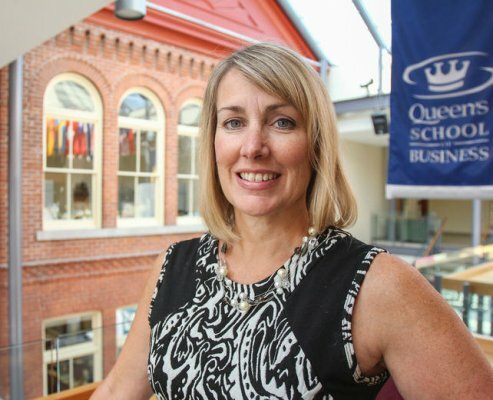 These days the former Queen’s business and engineering lecturer and Alma Mater ­Society (AMS) general manager is finishing a one-year term as president of the Professional Engineers of Ontario (PEO), the body that regulates and ­licenses the province’s 76,000 professional ­engineers. She was voted in as president-elect in 2011, served in that capacity in 2012, and stepped into the president’s role for 2013. She’s the sixth woman in the organization’s 91-year history to hold the voluntary position. That means a lot to Annette, who is ­constantly encouraging women to enter and assume leadership positions in the male-dominated profession. Vying for the PEO gig was a logical move for Annette, who previously served, twice, as the president of the Ontario Society of Professional Engineers, which advocates for, and provides various services to, the province’s engineers. Annette’s duties as PEO president included advocating for a repeal of a section in the ­Professional Engineers Act that exempted industrial manufacturers from the requirement to have a professional engineer on site to oversee the design and installation of large equipment in workplaces. The PEO has argued that the industrial exemption, in effect in Ontario since 1984, jeopardized workers’ safety. The other big-ticket item on her agenda was speaking on behalf of the PEO at the investigation into the June 2012 collapse of the Algo Centre Mall in Elliott Lake, Ontario, in which two people died. The investigator’s ­final report is due to be released in October. For her work at the helm of PEO, last year Annette was named one of Canada’s Top 25 Women of Influence by a Toronto-based ­organization dedicated to the professional ­advancement of women. Each year the group honours the country’s top female leaders in..."
Is Ontario Putting Business First, Safety Second? Annette Bergeron, president of Professional Engineers Ontario, sits down with Steve Paikin to discuss the Wynne government's decision to scrap a policy that could affect worker safety in Ontario. Earlier this summer, the Ontario government decided to scrap a repeal of section 12(3)(a) of the Professional Engineers Act, also known as the industrial exception. This section allowed some engineering work on machinery or equipment to be carried out by employees without an engineering license. Ontario is the only province in Canada to have this exception, making us, well, exceptional. The decision to leave the exception intact was applauded by some business groups, such as the Canadian Manufacturers & Exporters, who argued the repeal would have placed a heavy burden on businesses through increased regulation, costs and production delays. However, Professional Engineers Ontario (PEO), which is to engineers what the Law Society of Upper Canada is to lawyers, has been lobbying the government to repeal the industrial exception, arguing it's an important matter of workplace health and safety. 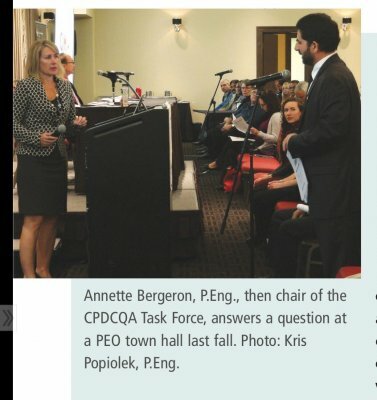 We invited PEO's president Annette Bergeron to flesh out the issue. now, so you’re off to a great start. graduation is just the first step in becoming a professional engineer. you must be licensed by Professional Engineers Ontario (PEO). is a worthwhile step in your career. Engineering Intern Program. Becoming an engineering..."
“Women of Impact” is a celebration of women’s achievements in science and engineering. Based on in-person interviews, this collection profiles eighteen women who have made significant contributions to the fields of materials, metallurgy, and mining in Canada. Their compelling stories and impressive achievements reveal how women have defied stereotypes, pushed through barriers, and passionately engaged with their industry. “Innovative Risk Review Determines Continuing Professional Development"
OS-3-1 "Shopping mall disaster accelerates risk questionnaire and professional education for engineers"